Gracie's is a "quirky parlor scooping unique flavors of ice cream in blowtorch-toasted cones with fun toppings," according to Google. 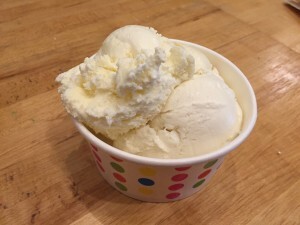 Their ice cream is homemade in small batches to ensue freshness. The menu always has dozen flavors, including a non-dairy option. Steve and I were hankering for dessert, after our unsatisfying dinner at Viale. For the sake of the Flog, we drove passed Christina's to Union Square to try Gracie's, a new ice cream shop that opened last year. It is a small storefront, but we were able to grab one of the three tables to enjoy our ice cream. The menu was eclectic, eschewing traditional flavors with offerings such as: salty whiskey, Fruity Pebbles, lemon verbena, subtle creamsicle and leftover Halloween candy. Steve ordered the Heath bar crunch and I got scoop each of lemon verbena, and subtle creamsicle ($4 for a small). The ice cream was thick, creamy and had the right mouth feel. The lemon verbena was better than the subtle creamsicle, which lived up to its name, in other words, too subtle. I sampled the salty whisky (strong alcohol flavor) and the Halloween candy (weak candy flavor). I think Gracie's is a fine opinion if you are in the area, but Christine's has a far better selection of flavors and seating.